It was a cold, snowy winter day. We had traveled far and were hungry for something cozy and warming. When we thought we could go no further, a hobbit hole appeared. It was warm and inviting and smelled of delicious vittles. The name of this establishment...Bilbo Baggins. 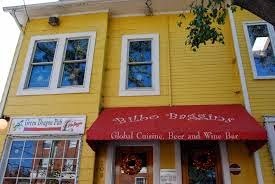 In downtown Alexandria, Bilbo Baggins is a little pub that looks like its straight out of a J.R.R. Tolkien novel. Creaky hardwood floors, small and cozy, wood and stone walls, and good hearty food. Perfect for a cold winter's day. Superking and I, along with our friend Tierney, were ready for a hobbit's adventure of a meal. We started with some small plates. A portobello mushroom cap marinated in pesto, topped with a round of breaded brie cheese and a tomato tapenade and drizzled with a balsamic glaze. Looks pretty elegant for pub food. It was pretty tasty too. Though whats not to like about fried, breaded cheese. We also had Calamari Fritti...fried calamari served with Thai chili aioli and a papaya relish. The calamari was perfectly cooked, which is quite a feat. It can be tricky to not overcook calamari and not turn it into rubber bands. Who wants to eat rubber bands? Well, Bilbo Baggins did it just right. The aioli was creamy and spicy. I was not particularly a fan of the papaya relish but it was bright and fresh. Or how about some buttermilk fried oysters? I used to not really like any oysters, that is until I went to Charleston and some proper ones. I still won't eat the raw ones (its a texture thing...too slimy) but a good fried one or baked one with the right toppings, sure does hit the spot when you're looking for a hearty meal. These at Bilbo's were crispy and briny and served with a nice basil lime aioli. We also had a taste of a Carolina pulled pork BBQ sandwich, and two kinds of fries. I forgot to take pictures of those, unfortunately. Yucca fries with a mustard aioli sauce and spicy cilantro fries with a chipotle chili sauce. I'd never had yucca fries but they were thick and salty, and more starchy than regular fries. After a brisk walk through the old town street shops, we hustled in to one of the old time ice cream parlors...Pops Old Fashioned Ice Cream to be exact. Even on a cold wintery day, nothing beats a good chocolate peanut butter ice cream!